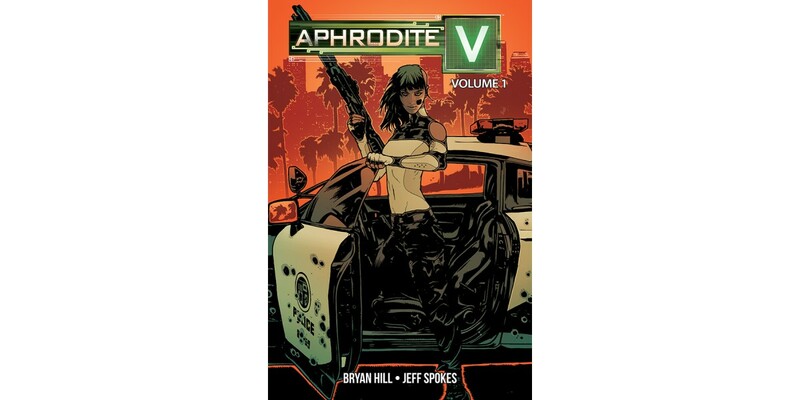 Bryan Hill (CYBER FORCE, POSTAL) and Jeff Spokes will release APHRODITE V, VOL. 1 this December from Image/Top Cow. In the near future, Los Angeles is a city on the brink of evolution, struggling with a new wave of terror powered by black market technology. Enter Aphrodite V: a fugitive from her masters, seeking individuality and purpose. She is the bleeding edge of biomechanics…and Los Angeles’ best hope against a new enemy that seeks to become a god among machines. One machine wants to destroy the city. Another has come to save it. Only one will survive. APHRODITE V, VOL. 1 (Diamond code: OCT180052, ISBN: 978-1-5343-0984-5) hits comic book stores on Wednesday, December 19th and bookstores on Tuesday, December 25th. It can be preordered via Amazon, Barnes & Noble, Books-A-Million, Indiebound, and Indigo. APHRODITE V, VOL. 1 will also be available for purchase across many digital platforms, including the official Image Comics iOS app, Amazon Kindle, Apple Books, comiXology, and Google Play.